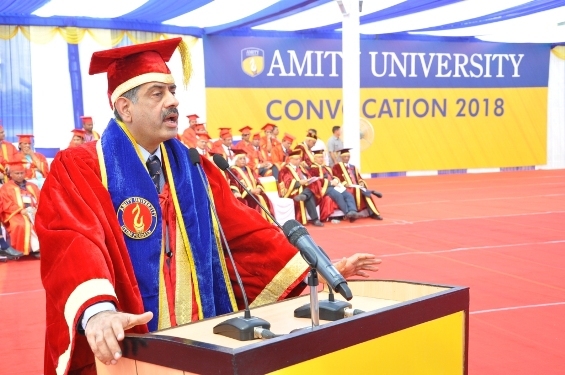 Thousands of students of Amity of class 2018 enrolled under Science, Engineering &Technology Domain received their degrees and diplomas during the three day“Convocation 2018” of Amity University, Uttar Pradesh which commenced today at University Campus, Sector-125, Noida. Graduands from over 30 Institutions came from different parts of the country, accompanied by their family members and friends who received their much awaited Degrees and Diplomas. The Graduands clad in black robes, red and yellow capes representing their respective programmes, beamed with joy and exultation as they re- united with their faculty members and mentors who were equally excited to see their students doing exceptionally well in their careers within a short span of time. 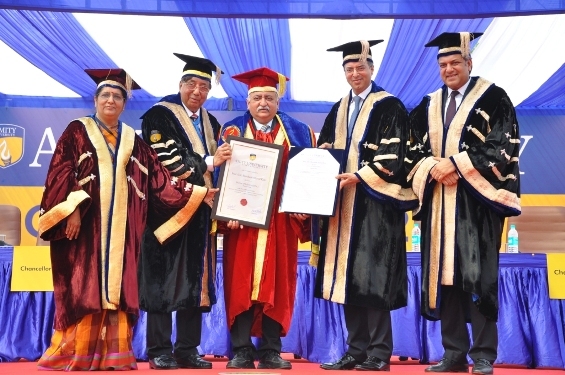 The Convocation began with a majestic and grand academic procession of Trustees and members of the Management, Senior officials of RBEF and Directors/HoDs of various Institutes and Departments of Amity Universities led by the band from CRPF. 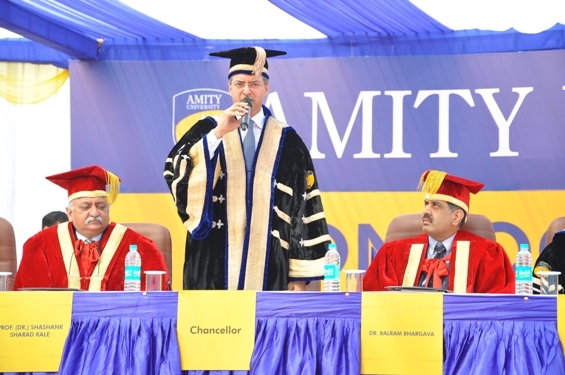 Dr. Atul Chauhan-Chancellor, Amity University, Uttar Pradesh declared the Convocation open. Dr. Balram Bhargava, Secretary, Department of Health Research (Ministry of Health and Family Welfare), Govt of India, Director General Indian Council of Medical Research; Prof. (Dr.) Shashank Sharad Kale, Head of Department (Neurosurgery),AIIMS and Padmashree and Padmabhushan Vaidya Devendra Triguna, Former Honorary Physician to President of India were awarded Honorary Doctorate Degrees. 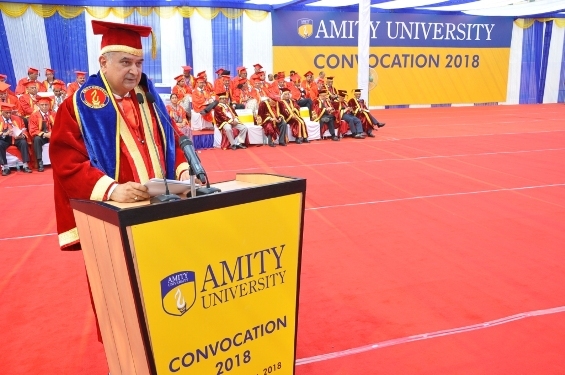 Welcoming the gathering, Dr. Ashok K Chauhan, Founder President, Amity Education Group congratulated the worthy graduands on receiving the degrees after years of diligence and perseverance. He also applauded the parents and grandparents of graduands who were a pillar of support for their ward throughout. He shared that every Amitian is destined to be successful as they are nurtured to work against all challenges and imbibed with traditional values and ethos which aid them to stay focus both professionally and personally. Dr. Chauhan remarked that India has the potential to be a global leader and to be the first innovation based country by fostering innovation in every young mind. He urged the graduands to dream big with open eyes and with focus on innovative ideas, which will lead them to galloping success. 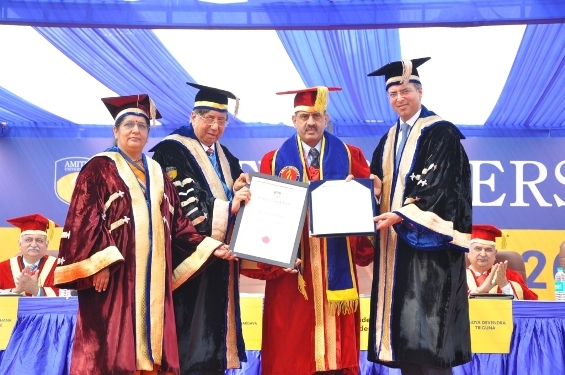 Accepting the honorary doctorate degree, Dr. Balram Bhargava, Secretary, Department of Health Research (Ministry of Health and Family Welfare), Govt of India,Director General Indian Council of Medical Research said that he sees Amity as the ‘Modern Day Gurukul of India’ wherein a holistic development through global education and traditional values is imparted in every student. He averred that India has witnessed phenomenal growth in every field and industry especially in bringing forth the Green Revolution. He added that over the years, Indian medical sciences has ensured to provide global healthcare facility to every patient within the country itself. However, there has been two major frontiers in healthcare, one is emergency medicine and second is providing universal health coverage that still needs to be taken care, he elaborates. Dr. Bhargava emphasized that these challenges are being addressed by the Prime Minister of India through Ayushman Bharat Programme by developing the wellness centres and ensuring Insurance schemes for 10 crore families. 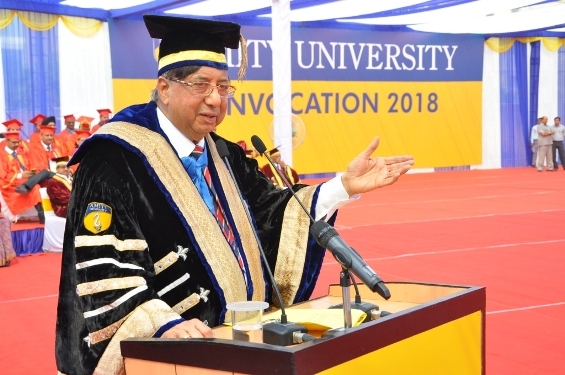 He called upon scientists and researchers of Amity to be the part of this healthcare development by contributing through bio-medical research. 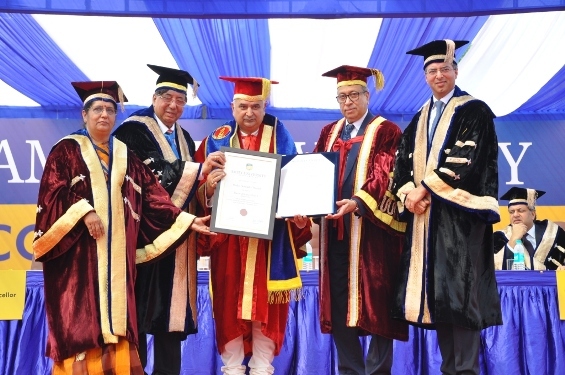 While accepting the Honorary Doctorate Degree, Padmashree and Padmabhushan Vaidya Devendra Triguna, Former Honorary Physician to President of India thanked Amity for bestowing the honor upon him and commended Amity for its enormous growth as an education and research based University in a short span of time.He stressed that Yoga and Indian Medicine System has started to gain global recognition. Now, the aim of the Indian Government is to provide cost effective healthcare through Ayurveda to every citizen. He highlighted the need to synergize Ayurveda with modern medicines to offer holistic healthcare to the world. He urged Amity to establish a world class education centre for Ayurvedato nurture global Ayurveda practitioners who will also conduct research for forgotten an undocumented ayurvedic remedies to cure diseases. Delivering his acceptance speech, Prof. (Dr.) Shashank Sharad Kale, Head of Department(Neurosurgery), AIIMS expressed his humble gratitude towards the honor conferred upon him and motivated the graduands to consistently work hard to achieve the aim they have set for themselves since success is entirely possible through unswerving dedication and persistent to accomplish the goal. 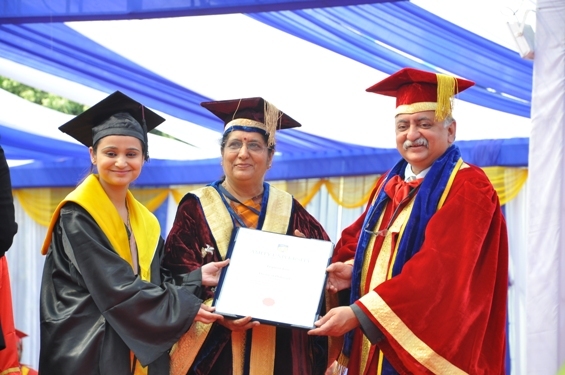 Dr. Balvinder Shukla, Vice Chancellor, Amity University Uttar Pradesh presented a brief report on the academic and research achievements during Academic year 2017-18 wherein she touched upon the salient developments including publications, collaborations & collaborative research, awards,distinguished visitors, student activities, placement etc and important achievements of Amity University Uttar Pradesh. 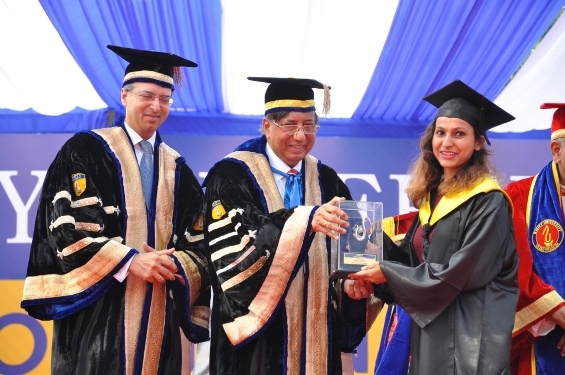 65 Gold Medals, 64 Silver Medals, 37 Bronze Medals and 73 PhDs were awarded to the meritorious students. 47 students were awarded Baljit Shastri Award and 12 students were awarded Best All Round Student Trophies.